If space is humankind’s ultimate challenge, then the first step starts close to home – we have still to explore much of our solar system that spans across enormous distances, never mind those galaxies and stars more distant still. To learn more we must get closer, dispatching spacecraft such as New Horizons – which has just returned our first ever close-up images of Pluto after a nine year journey. Here are my top five missions that are chipping away at what we don’t know and building up a better sense of universe around us. Time for your close-up, Pluto. 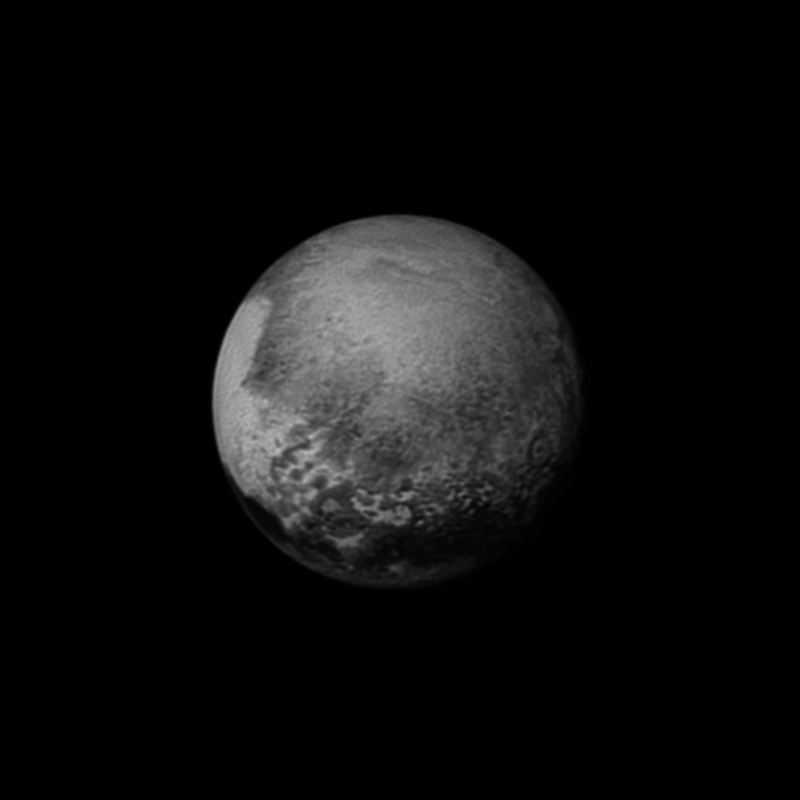 Rocketing past at 14km/s, the New Horizons spacecraft has provided our first close view of Pluto which will enormously improve our understanding of this distant body. Our facts regarding this icy dwarf are sketchy at best. Just knowing what Pluto looks like makes it much more real. The probe’s brief two-hour visit captured images of parts of Pluto and its largest moon Charon at high resolution, improving our understanding of planet formation. This is an amazing feat, considering the signals take more than 4.5 hours to reach Earth and that the sun is so weak at this extreme distance that solar power is not an option. But the mission doesn’t end here: in 2019 New Horizons will visit a small object in the Kuiper belt, a region of space filled with small rocky planetoids, giving us a chance to examine the make-up of these remnants of the early solar system. And by 2026, it will reach the outer edges of the solar system. Comet 67P/Churyumov-Gerasimenko, as seen from Rosetta 20km above. Conceived decades ago, Rosetta flew alone through space for years before it reached the tiny comet that was its target and swung into orbit around it. Given the comet’s highly irregular shape this is an outstanding feat by itself. The lander Philae managed to touch down and collect surface data of the comet, and while it was forced to shut down from lack of sunlight falling on its solar panels, it has now awoken and is transmitting data again. 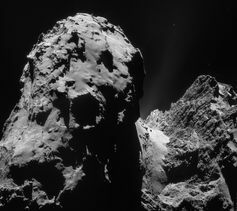 The Rosetta orbiter mission has also been extended to 2016 when it will also attempt to land on the comet. The missions have improved our understanding of comets which contain frozen, icy rocks, and have measured the gas composition of jets streaming off the comet before they are altered by solar radiation. But more than just hard numbers, this mission has been capturing images that speak for themselves, showing an ambitious mission conceived by many nations working together. Images such as Rosetta’s pictures of Philae descending resonates with us more than just hard facts and figures. Dawn is another mission expanding our knowledge of dwarf planets, in this case Ceres. It is now orbiting this interesting object having spent 2011 conducting similar work around nearby Vesta. Both Vesta and Ceres in the asteroid belt are protoplanets but of quite different composition. Dawn has illustrated how powerful imagery can be. The most intriguing image is a crater that contains a handful of bright white spots on a surface otherwise darker than coal – unexpected, unexplored, challenging terrain. 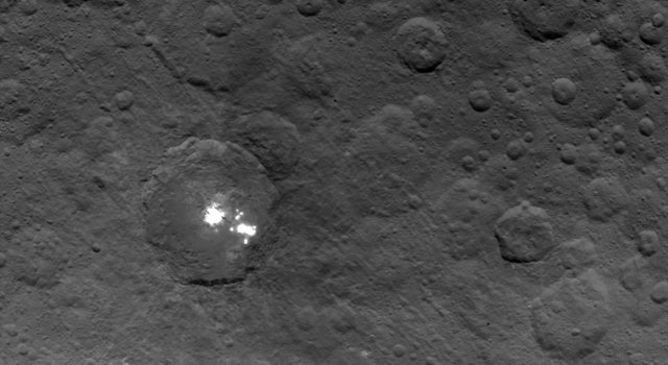 What is the bright spot on the surface of Ceres? Dawn will find out. Incredibly detailed images from Messenger’s visit to Mercury. 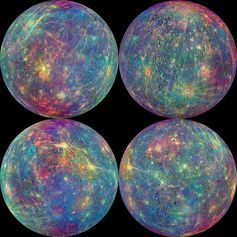 Messenger is still in my list of impressive space probes even though the mission ended with its controlled crash on Mercury’s surface this April. Sent to explore a planet of which we had barely any imagery of its surface, in four years Messenger managed to not only give us high-resolution maps of the innermost planet, it discovered water in its dark polar craters. On a planet baked by the sun this could only arrive from comets and water-rich asteroids – objects currently under investigation by Rosetta and New Horizons. 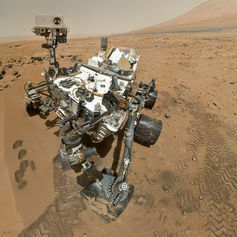 Curiosity Rover’s famous off-world self-portrait from Mars. The last is the Curiosity rover. For me it sums up the efforts to explore our neighbour, Mars. These missions went in search of life and traces of water, carrying a complex laboratory, drills, laser and high resolution cameras. Curiosity particularly illustrates the challenges we are capable of mastering to land a probe on Mars – described by NASA themselves as “seven minutes of terror”. These rovers have achieved an outstanding feat, where now those exploring beyond Earth are not astronomers but geologists, the rovers’ equipment replacing the hammer and microscope used during fieldwork. The missions have added Mars to the “territory” that humans have access to. It’s even on Google Maps – imagery so good that we can see its surface as if we were there and can look at rocks in such detail as if we were picking up pebbles at the beach. Probes have witnessed solar eclipses and comet fly-bys that provide an entirely different view than is possible from Earth – something that adds a feel of awe and wonder, like looking back on Earth from the moon. The sort of incredible images provided by these probes connects us with the solar system, bringing it closer to home. Famous images of Earth from space, such as the Blue Marble and the Pale Blue Dot catalysed our ecological conscience, reminding us of the fragility of our world in comparison to the vast, cold emptiness of outer space. Such images lead us on to explore the universe and ourselves, and the findings of these remarkable spacecraft that have travelled millions, sometimes billions of miles through space over many years remind us that it’s out there to be discovered. The challenge and rewards await, as J F Kennedy said: we choose to go to space not because it is easy, but because it is hard. Daniel Brown is Lecturer in Astronomy at Nottingham Trent University.